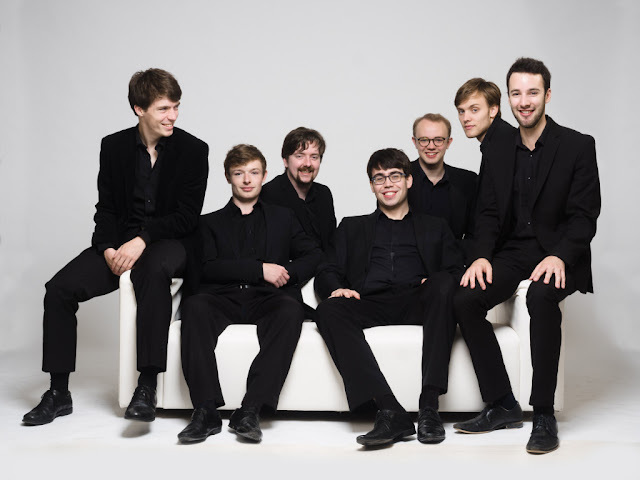 The Gesualdo Six is going on tour from 29 August 2017, the group's third Summer tour, taking in a variety of chapels and churches in the South of England (some with particular associations for the group) and performing programmes which mix of old and new, plus folk song arrangements and selection of light music alongside. The mix of favourite renaissance and modern works is intended to draw musical parallels despite the centuries that lie between the pieces. The tour kicks off in Trinity College Chapel (Cambridge, where the group gave its first concert just over three years ago) and then takes in the church of St John the Baptist (North Luffenham, Rutland), the church of All Saints (Northampton), the church of All Saints (Odiham), the church of St Mary Redcliffe (Bristol) and the church of St James the Great (Dursley, where one of the group's counter-tenors was a chorister from 2002-2006. Vocal consort the Gesualdo Six, conducted by Owain Park, was formed in March 2014 for a performance of Gesualdo's Tenebrae Responsorie for Maundy Thursday. Programmes focus mainly on early music, often alongside contemporary pieces. The group was in the finale of the 2015 London A Cappella Choir Competition and during 2015/16 the group was one St John's Smith Square's Young Artists, and their first CD comes out later this year. Full details from the group's website and you can catch the group talking about the forthcoming tour on BBC Radio 3's In Tune on 28 August 2017.